A Slackline is a cross between a balance beam and a trampoline. Bruce said he got his as a Christmas present. This weekend we were having a January Thaw sans a January Freeze (so far), a warm winter, wind-free Saturday afternoon. Bruce brought his Slackline to the park. A tightrope? Don’t be so 20th century. Slacklining is TOTALLY different. There is not the same level of tension as a tightrope, and it’s the width of a wide ribbon, some kind of nylon and canvas, a band as sturdy as a harness. 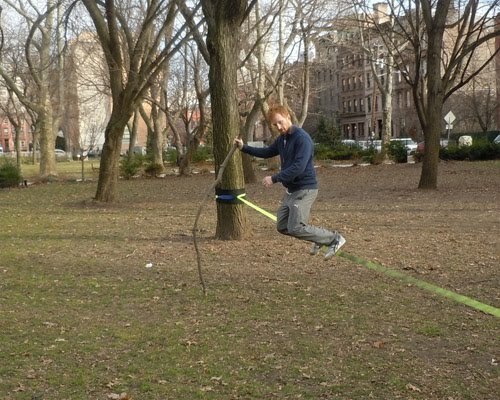 A google reveals that Slackline has reached something tightrope walking never could, single word verb status: Slacklining. This was Bruce’s third time Slacklining. I’m getting better, he said. 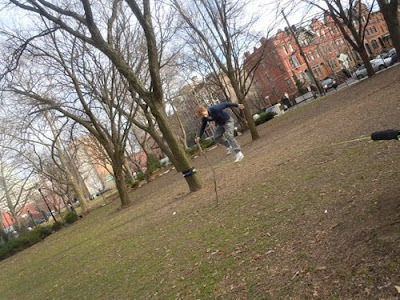 He was able to walk across the expanse between the two threes – a Slackline resembles a narrow hammock – unaided, but for hops and leaps, he used a stick to maintain balance. Slacklining may be relatively new, but there are already dozens of websites, newsgroups – Slacklining yoga, Slacklining martial arts, Slacklining competitions – beach Slacklining vs. urban Slacklining – Slacklining social media. The whole nine yards. What, did you expect something else? Relatively new is a relative concept. 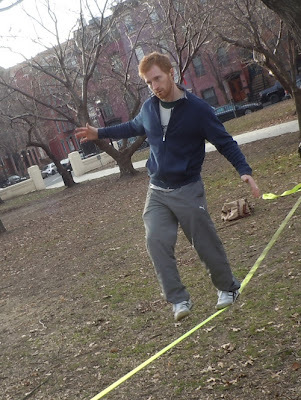 Slacklining is hot, the new rollerblading or skateboarding and if you don’t believe me you are really doubting the entire internet, blasphemer. To be fair, spell check still denotes it as two words, so is still officially a fad, not yet a trend. Happens all the time and I know I'm not alone. 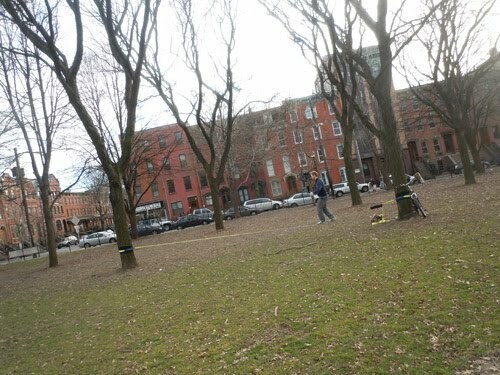 I see something that appears somewhat unusual in the park while enjoying some rare sun on a winter’s day, go home and get on the computer then find out there’s a whole Slackliner world out there. Slacklining is not just a cult, it’s a coalition of cults. I keep finding loops that not only am I not in, but I have no knowledge or awareness of. Sign on to the internet, only to find out more than I ever wanted to know about that loop until now I never knew existed. I have not been there or done that but in this day and age, within a few mouse clicks, you feel like you have been there, done that, have the t-shirt and moved on to something else. The time separating information overload from complete ignorance will be measured in nanoseconds by the time you finish reading this sentence. 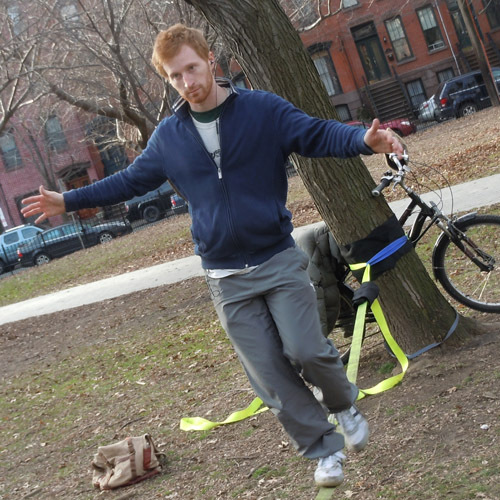 Why shouldn’t Slacklining be popular? It looks like fun, and aside from the likely sprained ankle, relatively safe. Now it has arrived in Jersey City, where it should be noted that since Hamilton Park was renovated and dog runs installed, now the trees and lawns can be used, enjoyed. Slacklining would not have been possible, just a few short years ago, when dogs were allowed to run wild and poop with abandon. Let a thousand Slacklines bloom. Okay, not a thousand but I do like to think that public space should encourage, not limit, our imaginations. Let our creativity soar as high and as far as a Frisbee. Hey, watch out for the guy on the Slackline! Since I’ve always lacked equilibrium and what little I have left is rapidly diminishing, I did not give Slacklining a try. I can barely do the limbo. But man, it looks like fun.